This article is about the protests that followed Freddie Gray's hospitalization and subsequent death in police custody. For information about the death itself, see Death of Freddie Gray. Protesters demonstrating at the Baltimore Police Department's Western District building. Legal prosecution of those responsible for Gray's death; an end to police brutality. 113 police officers injured, 2 people shot. One fire victim in critical condition. Greg Bailey: charged with obstructing firefighting operations, malicious destruction of property and reckless endangerment. State of emergency declared effective on April 27; rescinded May 6. A mandatory curfew was ordered beginning April 28 and ended May 3. On April 12, 2015, Baltimore Police Department officers arrested Freddie Gray, a 25-year-old African American resident of Baltimore, Maryland. Gray sustained injuries to his neck and spine while in transport in a police vehicle. On April 18, 2015, after Gray's subsequent coma, the residents of Baltimore protested in front of the Western district police station. Gray died the following day, April 19, 2015, a week after the arrest. Further protests were organized after Gray's death became public knowledge, amid the police department's continuing inability to adequately or consistently explain the events following the arrest and the injuries. Spontaneous protests started after the funeral service, although several included violent elements. Civil unrest continued with at least twenty police officers injured, at least 250 people arrested, 285 to 350 businesses damaged, 150 vehicle fires, 60 structure fires, 27 drugstores looted, thousands of police and Maryland National Guard troops deployed, and with a state of emergency declared in the city limits of Baltimore. The state of emergency was lifted on May 6. The series of protests took place against a historical backdrop of racial and poverty issues in Baltimore according to David M. Ettlin, longtime reporter from The Baltimore Sun, now retired. On May 1, 2015, Gray's death was ruled by the medical examiner to be a homicide. Six officers were charged with various offenses, including second-degree murder, in connection with Gray's death. Three officers were subsequently acquitted; in July 2016, following the acquittals, Baltimore City State's Attorney Marilyn Mosby dropped charges against the remaining three officers. On April 12, 2015, Freddie Carlos Gray, Jr., a 25-year-old African-American man, was arrested by the Baltimore City Police Department in the 1700 block of Presbury Street in the Sandtown-Winchester neighborhood. Gray was seen to be in good health at the time of the arrest. While being transported in a police van, Gray sustained injuries to his neck, including his vocal box and spinal cord. He fell into a coma and was taken to a trauma center. The BCPD could not immediately account for the injuries and released contradictory and inconsistent information regarding the timeline of the arrest, transportation and whether Gray had received appropriately prompt medical treatment. On May 23, 2016, officer Edward Nero was found not guilty of all charges against him in connection with the death of Freddie Gray. Shortly after that, the remaining officers who had not yet stood trial had all charges against them dropped. On April 18, 2015, immediately outside the Western District police station, hundreds of Baltimore citizens protested against the apparent mistreatment of Freddie Gray as well against inadequate and inconsistent information on police actions during the arrest and transport. Gray died at approximately 7am on April 19, 2015. Later that day, in response to Gray's death, Baltimore City Police Commissioner, Anthony Batts said, "I extend my deepest sympathies to his family" while also saying, "All Lives Matter" in a nod to the "Black Lives Matter" mantra shouted at protests. Protests continued during six nights in Baltimore's streets. On April 21, 2015, the Baltimore City Police Department released the identities of the six officers involved in Gray's arrest. That evening, protesters marched from the site of Gray's arrest to the Western District police station. On April 23, two people were arrested. 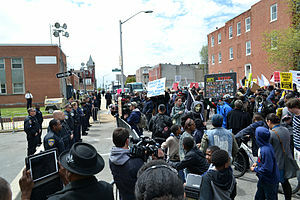 Tensions flared, but according to the Baltimore City Police Department, the remaining protesters that day were peaceful. On April 24, a coalition of organizations including the ACLU, the NAACP, CASA de Maryland, and Leaders of a Beautiful Struggle requested Governor Larry Hogan to act and address issues of police brutality. On April 25, 2015, protests were organized in downtown Baltimore. Protesters marched from the Baltimore City Hall to the Inner Harbor. After the final stage of the official protest event, some people became violent, damaging at least five police vehicles and pelting police with rocks. Near Oriole Park at Camden Yards, some groups of violent protesters also smashed storefronts and fought with baseball fans arriving at the stadium for a scheduled game between the Baltimore Orioles and the Boston Red Sox. As a result of the violence, those attending the baseball game were forced to remain inside the stadium for their safety. At least 34 people were arrested during the riots, and six police officers were injured. J.M. Giordano, a photographer for Baltimore City Paper, was taking pictures of the protest when he was "swarmed" and beaten by two police officers in riot gear. Sait Serkan Gurbuz, a Reuters photographer with visible press credentials, who photographed the scuffle from a public sidewalk, was tackled, handcuffed and walked to the Western District station. He was cited for failure to obey and later released. Subsequently, City Paper published a video on its website documenting the violence. During a press conference, Baltimore mayor Stephanie Rawlings-Blake said, "most protesters were respectful but a small group of agitators intervened". She also stated that "It's a very delicate balancing act. Because while we try to make sure that they were protected from the cars and other things that were going on, we also gave those who wished to destroy space to do that as well. And we worked very hard to keep that balance and to put ourselves in the best position to de-escalate." The phrase "we also gave those who wished to destroy space to do that as well" was interpreted by some conservative-leaning news sources as an indication that the mayor was giving permission to protesters to destroy property. What she is saying within this statement was that there was an effort to give the peaceful demonstrators room to conduct their peaceful protests on Saturday. Unfortunately, as a result of providing the peaceful demonstrators with the space to share their message, that also meant that those seeking to incite violence also had the space to operate. The police sought to balance the rights of the peaceful demonstrators against the need to step in against those who were seeking to create violence. The mayor is not saying that she asked police to give space to people who sought to create violence. Any suggestion otherwise would be a misinterpretation of her statement. A funeral service was held for Freddie Gray at the New Shiloh Baptist Church on April 27 at 11 a.m. , after a one-hour public viewing. A large attendance included civil rights leaders, families of other people killed by police, and politicians including Congressman Elijah Cummings, Cabinet Secretary Broderick Johnson, White House adviser Heather Foster, and Elias Alcantara of the Office of Intergovernmental Affairs. Gray is buried at Woodlawn Cemetery in Baltimore County, Maryland. A photograph of the April 25 rioters standing on a Baltimore police car was superimposed with the text "All HighSchools Monday @3 We Are Going To Purge From Mondawmin To The Ave, Back To Downtown #Fdl" ("Purge" being a reference to the film series) and distributed on social media and as flyers. In response, Mondawmin Mall was closed at 2:15 p.m. and police in riot gear were deployed to the area. In preparation for the 'purge' police shut down the Mondawmin metro stop and also blockaded many of the nearby streets. As a result, students from Frederick Douglass High School, which is across the street from Mondawmin Mall, had considerable difficulty leaving the area via public transportation when their classes ended an hour after the "purge" began, and contributed to the swelling crowd. According to eyewitness reports, expecting the "purge" to start at 3 p.m., Baltimore police pre-emptively de-boarded all buses going through the area, shut down the nearby Mondawmin Metro station and cordoned off the area around the mall. Eyewitnesses saw police detain students in that general area. The police, in full riot gear, detained the students for a full half-hour before the first brick was thrown. Meghann Harris, a teacher in the Baltimore school system, said on Facebook, "If I were a Douglass[sic] student that just got trapped in the middle of a minefield BY cops without any way to get home and completely in harm's way, I'd be ready to pop off, too." Other closings in preparation or response to the riot included the University of Maryland Baltimore, which closed its campus in downtown Baltimore at 2:00 p.m. citing a police warning regarding "activities (that) may be potentially violent and UMB could be in the path of any violence", Baltimore City Community College, Coppin State University, the Lexington Market, the National Aquarium, and the Enoch Pratt Free Library system. The Baltimore Kinetic Sculpture Race was rescheduled from May 2 to June 14. A Baltimore Orioles baseball game against the Chicago White Sox scheduled for the evening at Oriole Park at Camden Yards, and the first of a three-game series, was also postponed due to the unrest. Initially 75–100 people who appeared to be high school students began throwing bricks and bottles at police near Mondawmin Mall after police refused high school students access to their primary means of getting home (the transportation hub at Mondawmin Mall), while ordering them to disperse and go home. The violence rapidly spread, and by later that day two patrol cars were destroyed and fifteen officers were injured. A police cruiser was destroyed, and some officers suffered broken bones. A CVS Pharmacy location in West Baltimore was looted and burned by rioters; no one in the CVS was hurt because employees had been evacuated before the CVS was looted and burned, but a fire hose used later to put out the CVS fire was punctured by a rioter. In East Baltimore, the Mary Harvin Senior Center, an under-construction senior housing and services project, burned to the ground; it was rebuilt and opened in April 2016. At about 6:00 a.m. , Baltimore television showed firefighters putting out fires and residents cleaning up after the overnight rioting. Soldiers from the 1st Battalion, 175th Infantry Regiment, Maryland Army National Guard arrived in Baltimore to provide security to vital infrastructure and to give additional support to police. At about 7:35 a.m. , the Baltimore mayor's office reported that there were 144 vehicle fires, 15 structural fires, and nearly 200 arrests. One person had been badly hurt due to an arson. At 8:25 a.m. , it was announced that Maryland Gov. Larry Hogan was temporarily moving his office from Annapolis to Baltimore and that Hogan would visit scenes around Baltimore. At approximately 9:00 a.m., Hogan visited an intersection on West Baltimore that was heavily affected by the rioting with damaged vehicles and a looted convenience store, thanking those in the area for help cleaning up the streets. In one incident that went viral during the previous night, Baltimore mother, Toya Graham, repeatedly struck and berated her son on TV for throwing rocks at police. Graham stated that she didn't want her son to end up like Freddie Gray, but also that he shouldn't seek justice by rioting. At 11:15 a.m. on April 28, Baltimore Police Commissioner Anthony Batts praised Graham, stating, "I wish I had more parents that took charge of their kids out there." Baltimore County police spokesman Cpl. John Wachter also announced that Security Square Mall was going to be closed for the rest of the day following the spreading of rumors that planned actions were going to occur there. The Social Security Administration and the Centers for Medicare and Medicaid Services also closed. At 12:00 p.m. in the area where Freddie Gray was arrested, volunteers numbering in the hundreds were seen cleaning up debris left from the rioting. Police blocked off some of the area to assist with the cleanup while hardware stores in the neighborhood donated trash bags and brooms and city workers drove in trucks to carry away piles of trash and shattered glass. At 12:55 p.m. , President Obama stated that there have been too many worrying interactions between police and black citizens, but said there was "no excuse" for the violence of rioters in Baltimore. At about 1:30 p.m., crowds gathered at a damaged drug store where Rev. Jesse Jackson was visiting, with Jackson stating, "It was painful because it destroyed a lot of neighborhood businesses and hurt a lot of people, but the violence is driven by that alienation." At a 2:30 p.m. speaking event by Capt. Eric Kowalczyk discussing incidents that occurred on April 27, demonstrators gathered peacefully, though one individual was arrested and pepper spray was used when some protesters became disorderly. At 3:00 p.m. , Mayor Stephanie Rawlings-Blake took back comments calling rioters "thugs", saying that occasionally, "my little anger interpreter gets the best of me." Baltimore religious leaders announced that 14 churches throughout the city were open to give food to children that relied on schools to provide daily meals. At 8:30 p.m. , the CEO of Baltimore City Public Schools, Gregory Thornton, announced that Baltimore City Public School classes and after-school events would occur on April 29. Just before 9:00 p.m. , several hundred protesters gathered around the CVS store that was looted, with some individuals separating the protesters and police, while a local pastor told demonstrators over a loud speaker to respect the curfew, saying, "Let's show the world, because the eyes of the world are on Baltimore right now." A police spokesman, Captain Eric Kowalczyk, stated that authorities were attempting to inform Baltimore residents of the 10:00 p.m. curfew in multiple ways, through police in patrol cars, sending messages through a police helicopter over the city and by calling residents through a Reverse 911 system. At 10:15 p.m. , hundreds of demonstrators, some throwing bottles at police, remained in the streets while police in riot gear began to move the crowds with speakers from helicopters overhead broadcasting, "You must go home. You cannot remain here. You will be subject to arrest." Tensions began to grow after individuals began to throw objects at police. Shortly after 10:30 p.m. , smoke bombs or fireworks were thrown from the crowd and police equipped with riot shields began to slowly advance on the gathering with some people beginning to disperse. At 10:32 p.m. , Baltimore Police tweeted that "Officers are now deploying pepper balls at the aggressive crowd". They then tweeted at 10:34 p.m. "People who remain on the street – who do not meet the exceptions – are now in violation of the emergency curfew" with police moving across the intersection and the crowd dispersing down side streets away from the area. At 10:50 p.m. , military vehicles were seen driving through the streets to disperse the remaining crowd numbered with dozens of people. At 11:00 p.m. , the CVS intersection was clear except for police and media workers who were exempt from the curfew. At 11:40 p.m. , Baltimore Police Commissioner Anthony Batts stated that the curfew seemed to work and that ten people were arrested; seven for violating the curfew, two people for looting and one for disorderly conduct. Between start of curfew and late night, thirty-five people, including one juvenile, had been arrested for violating the curfew. After the riots, many small business owners struggled to clean up. Over 200 small businesses were unable to reopen by April 29. Residents of all ages, genders, and races came together to help clean Baltimore's streets. Eighteen were arrested for curfew violations on April 29. From April 29-May 3, 2015 FBI surveillance aircraft used FLIR cameras to record video of civil unrest. In August 2016, 18 hours of footage was released following a FOIA request from the American Civil Liberties Union. By April 30, over forty South Korean-owned businesses had been damaged by the riots. Chinese American and Arab American owned stores were also targeted, with looters directed by African American gangs towards those businesses. Forty people were arrested for such night violations on May 1. After the largest peaceful rally on Saturday, May 2, 2015, 46 people were arrested during the night time curfew. One person arrested on May 2 was News2Share journalist Ford Fischer. He was handcuffed and initially charged with violating curfew, despite the police confirming that "he's credentialed media." After confirming the charge as "curfew violation" to another journalist, they changed it to a civil citation for "Disorderly Conduct." As of May 21, he still faces that citation. This all came after the police department had confirmed that media are exempt from the curfew via Twitter. The night curfew on the city was lifted on May 3. Meanwhile, all charges against violators were dropped. It was found that in section 14-107 of the state's public safety code, only the governor and not the mayor has the authority to issue a curfew. It was decided that the arrests of violators were punishment enough. Those who committed violations of the law other than curfew violations have still been prosecuted. The Maryland National Guard withdrew completely from Baltimore on May 4. Initially, the Baltimore Police Department suspended six officers with pay pending an investigation of Gray's death. The six officers involved in the arrest were identified as Lieutenant Brian Rice, Sergeant Alicia White, Officer William Porter, Officer Garrett Miller, Officer Edward Nero, and Officer Caesar Goodson. On April 24, 2015, Police Commissioner Anthony Batts said, "We know our police employees failed to get him medical attention in a timely manner multiple times." Batts also acknowledged police did not follow procedure when they failed to buckle Gray in the van while he was being transported to the police station. The U.S. Department of Justice also opened an investigation into the case. On May 1, 2015, after receiving a medical examiner's report ruling Gray's death a homicide, state prosecutors said that they had probable cause to file criminal charges against the six officers involved. Mosby said that the Baltimore police had acted illegally and that "No crime had been committed [by Freddie Gray]". Mosby said that Gray "suffered a critical neck injury as a result of being handcuffed, shackled by his feet and unrestrained inside the BPD wagon." Mosby said officers had "failed to establish probable cause for Mr. Gray's arrest, as no crime had been committed", and charged officers with false imprisonment, because Gray was carrying a pocket knife of legal size, and not the switchblade police claimed he had possessed at the time of his arrest. All six officers were taken into custody and processed at Baltimore Central Booking and Intake Center. The trial of Officer William G. Porter, a black officer and the first of the six charged officers to go to trial, ended in a mistrial. The Prosecution had intended to have Porter testify against both his supervisor on the day, Sgt. Alicia White, and the driver of the van, Officer Caesar Goodson Jr. The trials ran into significant delays due to multiple motions being filed by both sides in the cases. On May 23, 2016, Officer Edward Nero was found not guilty on all four counts he was charged with, including two counts of misconduct in office, misdemeanor reckless endangerment, and misdemeanor assault in the second degree. In addition to Nero, two others officers were subsequently acquitted. In July 2016, following the acquittals, Baltimore City State's Attorney Marilyn Mosby dropped charges against Porter and the remaining two officers. Policemen surround protesters at East 19th Street in New York City. On April 29, 2015, protesters marched through New York City, blocking off traffic in key areas, including the Holland Tunnel and West Side Highway. Carmen Perez, director of the criminal justice reform group Justice League, said, "It's all about solidarity, We're here to spread the message of peace from Baltimore's initial protests." More than 100 people were arrested, and the police did not allow the protest to take form before making arrests. Anti-police brutality protests were also held in Denver in solidarity with the Baltimore protests. Eleven people were arrested on April 29, 2015 following physical altercations in which police used pepper spray on protesters who rallied around Colfax Avenue and Broadway street. The confrontation occurred shortly after 7 p.m. when an officer was knocked off his motorcycle by a protester and assaulted by five others. Police reported force was used in response to the incident. By 7:40 p.m., Broadway street was cleared for traffic as protesters relocated to the 16th Street Mall. There were also solidarity protests in the cities of Ann Arbor, Albuquerque, Boston, Cincinnati, Minneapolis, Oakland, Philadelphia, Seattle, and Washington, D.C.
At a press conference in the evening, the mayor announced there would be a citywide curfew of 10:00 p.m. to 5:00 a.m. starting April 28. The Baltimore solicitor's office stated that a limitation of the curfew to only certain neighborhoods could potentially be viewed as racial discrimination. Neighboring Anne Arundel and Baltimore Counties cancelled school field trips and activities scheduled in Baltimore City until May 3. Officials also announced that Baltimore's city schools would be closed on Tuesday. Maryland Governor Larry Hogan declared a state of emergency and activated the Maryland National Guard. Major General Linda Singh of the Maryland National Guard commented that there would be a "massive number" of soldiers in Maryland on the night of April 27, and that up to 5,000 soldiers could be deployed. Maryland State Police activated 500 officers for duty in Baltimore, and requested an additional 5,000 state police officers from other states. Business owners in the city complained that the curfew required establishments with later hours to close their doors early, thereby costing them revenue from later hours customers and hurting their employees by forcing them to work fewer hours. Some businesses complained that the curfew cost them as much as $50,000. While those with night jobs were given an exemption to be allowed to travel to work, early closing hours continued to cost employees work hours. Despite criticism of curfew enforcement, Mayor Rawlings-Blake stood by the curfew, saying it was necessary to maintain control. U.S. Attorney General Loretta Lynch requested an independent civil rights investigation into the Freddie Gray case in hopes of calming the violence in Baltimore. The Baltimore Ravens had canceled their NFL Draft party in response to the riots. After consulting with Major League Baseball, the Baltimore Orioles announced that their second game in a series against the Chicago White Sox would also be postponed, and that their game on April 29 would be played in the afternoon behind closed doors. This was believed to be the first behind closed doors game in Major League Baseball history (it is occasionally seen in soccer as punishment for spectator behavior). The attendance for the game was officially recorded as zero, thus breaking the previous record (of six, set in 1882) for the lowest attendance at a Major League Baseball game. The two cancelled games were made up as a doubleheader on May 28. The team also moved its May 1–3 series against the Tampa Bay Rays from Camden Yards to Tropicana Field, but still played as the home team (despite the Rays hosting it). After Baltimore police determined there was a "credible threat" of gang violence against police officers across the country, many departments across the US heightened their security in response: for example the Los Angeles Police Department ordered their officers to ride in pairs. Baltimore police claimed evidence to support the idea that the Black Guerrilla Family, the Bloods, and the Crips were "teaming up" to target police officers. Later, however, leaders of both the Bloods and the Crips denied the allegations, released a video statement asking for calm and peaceful protest in the area, and joined with police and clergy to enforce the curfew. At one occasion, gang members helped to prevent a riot at the Security Square Mall by dispersing would-be rioters. On other occasions, rival gang members helped each other to protect black-owned businesses, black children, and reporters, diverting rioters to Korean-, Chinese-, and Arab-owned businesses instead. On yet another occasion, the Bloods, the Crips, and the Nation of Islam were seen taking a picture together and working together to dispel violence while peacefully demonstrating. On April 28, President Barack Obama strongly condemned the violence during a White House press conference, saying, "There's no excuse for the kind of violence that we saw yesterday. It is counterproductive. ... When individuals get crowbars and start prying open doors to loot, they're not protesting. They're not making a statement. They're stealing. When they burn down a building, they're committing arson. And they're destroying and undermining businesses and opportunities in their own communities. That robs jobs and opportunity from people in that area." Obama went on to applaud the actions of peaceful protesters who he felt were being undermined by the violence, and called upon the nation to take meaningful action to collectively solve poverty and law enforcement issues fueling what he described as "a crisis". On social media and elsewhere, Mayor Rawlings-Blake and President Obama were criticized for calling the rioters "thugs" on April 28. The protests were originally covered on social media with the hashtag #BaltimoreRiots. However, by April 28, the more popular hashtag to cover the protests became #BaltimoreUprising. The change may have occurred in response to a decline in violent actions, or may have been the promotion of a new political narrative by social media users. Baltimore recorded 43 homicides in the month of May, the second deadliest month on record and the worst since December 1971 when 44 homicides were recorded. There have also been more than 100 non-fatal shootings in May 2015. Police commissioner Anthony Batts blames looted drugs, stolen from 27 pharmacies and two methadone clinics, as well as street distribution and turf wars for the spike in crime. The increase in shootings has occurred along with a 50% decline in arrests since the charging of six officers in Gray's death in custody. The heavy police presence in crime-ridden neighborhoods is no longer apparent with one resident stating, "Before it was over-policing. Now there's no police." One officer speaking anonymously stated, "After the protests, it seems like the citizens would appreciate a lack of police presence, and that's exactly what they're getting." Batts stated that his officers are "not holding back" despite encountering hostility in the Western District whenever they make an arrest with "30 to 50 people surrounding them at any time;" he also stated that his officers feel "confused and unsupported" in the wake of the charges. The president of the police union said his members are "afraid of going to jail for doing their jobs properly." According to The New York Times, looting from 27 drugstores resulted in an increase in black market access to opiates. ^ a b c d Fenton, Justin (April 18, 2015). "Hundreds at Baltimore police station protest over man's injuries during arrest". The Baltimore Sun. Retrieved May 5, 2015. ^ a b c d Valcourt, Derek (April 19, 2015). "Freddie Gray Dies In Hospital One Week After Arrest In Baltimore". WJZ-TV. Retrieved May 5, 2015. ^ Simpson, Ian (April 18, 2015). "Crowds protest death of man after arrest by Baltimore police". Reuters. Retrieved May 5, 2015. ^ Terhune, Virginia (May 1, 2015). "Montgomery County Police Sends 40 Plus Officers to Assist Baltimore". The Gazette. Archived from the original on May 5, 2015. ^ "Montgomery County police chief talks Baltimore, community relations". WTOP. WTOP. Retrieved May 2, 2015. ^ a b "Accurately charging people arrested in Baltimore proves to be legal challenge". The Washington Post. May 4, 2015. Retrieved May 5, 2015. ^ Stolberg, Sheryl Gay (April 28, 2015). "Baltimore's Streets Fill With Civilians and National Guard Troops". The New York Times. Retrieved April 29, 2015. ^ Wood, Pamela (May 1, 2015). "Man charged with damaging hoses at CVS fire". The Baltimore Sun. Retrieved May 2, 2015. ^ a b Shapiro, Emily (April 27, 2015). "Maryland Gov. Declares State of Emergency After Violent Clashes in Baltimore". ABC News. Retrieved April 27, 2015. ^ a b Muskal, Michael; Hennigan, W.J. (April 27, 2015). "Baltimore mayor orders curfew; 'thugs' trying to tear down city, she says". Los Angeles Times. Retrieved April 27, 2015. ^ Sherman, Natalie (May 11, 2015). "GBC aims to help ex-offenders in wake of Baltimore's troubles". The Baltimore Sun. Retrieved May 12, 2015. ^ Wenger, Yvonne (May 13, 2015). "Damage to businesses from Baltimore rioting estimated at about $9 million". The Washington Post. Retrieved August 14, 2015. ^ Oppel, Richard A. Jr (June 12, 2015). "West Baltimore's Police Presence Drops, and Murders Soar". The New York Times. Retrieved August 14, 2015. ^ "Baltimore riots live updates: About 200 arrested after violence, fires sweep city". Los Angeles Times. April 28, 2015. Retrieved April 28, 2015. ^ Simpson, Ian; Strobel, Warren (April 28, 2015). "Thousands of police descend on Baltimore to enforce curfew after riots". Reuters. Retrieved April 29, 2015. ^ Calamur, Krishnadev (May 6, 2015). "Maryland Governor Lifts State Of Emergency In Baltimore". NPR.org. Retrieved August 14, 2015. ^ David Ettlin (May 5, 2015). "Racial tension haunts Baltimore across chasm of 45 years". Baltimore Post-Examiner. Retrieved February 6, 2016. ^ Blinder, Alan (May 1, 2015). "Prosecutors Charge 6 Baltimore Officers in Freddie Gray Death". New York Times. Retrieved May 1, 2015. ^ a b Sherl Gay Stolberg & Jess Bidgood, All Charges Dropped Against Baltimore Officers in Freddie Gray Case, New York Times (July 27, 2016). ^ a b c "Timeline: Freddie Gray's arrest, death and the aftermath - Baltimore Sun". data.baltimoresun.com. Retrieved November 18, 2015. ^ Fieldstadt, Elisha. "Officer Charged in Freddie Gray Case, Edward Nero, Not Guilty on All Counts". NBC News. Retrieved May 23, 2016. ^ Sun, Baltimore. "Freddie Gray dies a week after being injured during arrest". baltimoresun.com. Retrieved May 6, 2016. ^ Ileto, Christine (April 23, 2015). "Police Make Arrests; Protests Continue Over Freddie Gray's Death". WJZ-TV. Retrieved May 5, 2015. ^ Yan, Holly; Fantz, Ashley; Hutcherson, Kimberly (April 23, 2015). "Freddie Gray death: Protesters, police scuffle in Baltimore". CNN. Retrieved May 5, 2015. ^ "Civil rights groups call on Hogan to convene special session". baltimoresun.com. Retrieved November 18, 2015. ^ Stolberg, Sheryl Grey (August 27, 2015). "National Guard Activated in Baltimore as Police and Youths Clash After Funeral for Freddie Gray". The New York Times. Retrieved April 28, 2015. ^ Fiammetta, ike (April 25, 2015). "Fans Asked to Stay Inside Camden Yards due to Baltimore Protests". Sports Illustrated. Retrieved May 19, 2015 – via Google News. ^ "Fans at Orioles-Red Sox asked to stay in Camden Yards after violent protest". USA Today. April 25, 2015. Retrieved April 28, 2015. ^ a b Marquez, Miguel; Almasy, Steve (April 25, 2015). "Freddie Gray death: 12 arrested during protests". CNN. Retrieved April 25, 2015. ^ Wenger, Yvonne; Campbell, Colin. City leader calls for peace after 35 arrested, 6 officers injured, The Baltimore Sun, April 26, 2015. ^ a b Serpick, Evan (April 26, 2015). "City Paper photo editor J.M. Giordano beaten by police at Freddie Gray protest". City Paper (Baltimore). Retrieved April 28, 2015. ^ Associated Press (April 25, 2015). "The Latest: Baltimore mayor calls for peace after protests". The Washington Post. ISSN 0190-8286. Retrieved April 27, 2015. ^ "Baltimore Mayor: Space Was Provided To Those Who 'Wished To Destroy'". dailycaller.com. April 26, 2015. Retrieved April 28, 2015. ^ "Baltimore Mayor Gave Protesters 'Permission to Riot'". newsmax.com. April 28, 2015. Retrieved April 28, 2015. ^ "Baltimore mayor's 'balancing act' gave protestors permission to turn violent". foxnews.com. April 27, 2015. Retrieved April 28, 2015. ^ Kevin Harris (April 27, 2015). "Rawlings-Blake Administration Issues Statement Regarding Mayor's Comments on the Rights of Protesters". Retrieved April 28, 2015. ^ "Freddie Gray Funeral Held Amid Alleged Credible Threat to Law Enforcement". ABC News. April 27, 2015. ^ Yan, Holly; Fantz, Ashley (April 27, 2015). "Freddie Gray funeral draws White House officials, Eric Garner's family". CNN. ^ Marbella, Jean; Pitts, Jonathan (April 28, 2015). "Friends, family bid farewell to Freddie Gray". The Baltimore Sun. Retrieved May 6, 2015. ^ Smialowski, Brendan (April 27, 2015). "Freddie Gray is buried at Woodlawn Cemetery in Baltimore, Maryland, on April 27, 2015". Yahoo! News. Retrieved May 6, 2015. ^ Image cited in The New York Times "Mapping the Clashes"
^ "Mapping the Clashes Between Baltimore Police and Protesters". The New York Times. April 27, 2015. ^ "Baltimore Purge: Flyers Imitating 'The Purge' Reportedly Called For Violence, Contributed To Riots". Inquistr. April 28, 2015. ^ a b c Staff, WMAR. "Concerns over violence leads to area closings in Baltimore". WMAR. Archived from the original on April 30, 2015. Retrieved April 27, 2015. ^ a b c Brodey, Sam; McLaughlin, Jenna (April 28, 2015). "Eyewitnesses: The Baltimore Riots Didn't Start the Way You Think". Mother Jones. ^ P. Kenneth Burns (April 30, 2015). "Douglass Students Say They Got A Bad Rap". WYPR. ^ Bump, Philip (April 28, 2015). "Just one in four urban black Americans trust the police". The Washington Post. Retrieved April 30, 2015. ^ a b Bacon, John (April 27, 2015). "Baltimore police, protesters clash; 15 officers hurt". USA Today. Retrieved April 27, 2015. ^ Stolberg, Sheryl Gay (April 27, 2015). "National Guard Called Out in Baltimore as Police and Youths Clash After Funeral for Freddie Gray". The New York Times. Retrieved April 27, 2015. ^ "AVAM's Kinetic Sculpture Race rescheduled for June 14". The Baltimore Sun. Retrieved October 3, 2015. ^ a b "Orioles-White Sox game will be played Wednesday, closed to public". ESPN. April 28, 2015. Retrieved April 29, 2015. ^ "Tonight's Orioles game postponed amid violence downtown". The Baltimore Sun. Retrieved April 27, 2015. ^ Fuchs, Eric (April 28, 2015). "A confrontation between cops and teenagers kicked off the horrifying Baltimore riots". Business Insider. ^ Wing, Nick (April 28, 2015). "Police Throw Rocks Back At Protesters In Baltimore". The Huffington Post. ^ "7 officers wounded in Baltimore protests". HeraldTribune.com. Retrieved April 28, 2015. ^ Bacon, John (April 28, 2015). "Baltimore police, protesters clash; 15 officers hurt". CNN. Retrieved April 30, 2015. ^ Ford, Dana (April 27, 2015). "Baltimore protests turn violent; police injured". CNN. Retrieved April 27, 2015. ^ "CVS got employees out of Baltimore store just before looting and fire". CNN. April 27, 2015. Retrieved April 30, 2015. ^ Darcy, Oliver (April 27, 2015). "US Man Punctures Fire Hose As Firefighters Attempt to Put out CVS Fire in Baltimore". The Blaze. Retrieved April 30, 2015. ^ a b c d e f g "LATEST ON POLICE-CUSTODY DEATH: OBAMA: NO EXCUSE FOR RIOT". Associated Press. April 28, 2015. Archived from the original on April 28, 2015. Retrieved April 28, 2015. ^ a b "Baltimore riots: Security beefed up, cleanup starts after looting, fires". CNN. April 28, 2015. Retrieved April 28, 2015. ^ a b "Mom filmed berating her son at Baltimore riots didn't 'want him to be a Freddie Gray'". The Washington Post. ^ Reimer, Susan (April 30, 2015). "Send in the moms to stop Freddie Gray rioting". The Baltimore Sun. Retrieved May 7, 2015. ^ Rosenbaum, Sophia; Fredericks, Bob (April 28, 2015). "Baltimore Mom of the Year: 'I don't want him to be a Freddie Gray'". The New York Post. Retrieved May 7, 2015. ^ "VIDEO: Mom beats child for throwing rocks at Baltimore Police". WMAR. Archived from the original on April 29, 2015. Retrieved April 29, 2015. ^ "VIDEO: Angry mom beats son suspected of rioting in Baltimore". ABC7 New York. ^ "Baltimore County squashes rumors of another 'purge' outside city". Baltimore Sun. April 28, 2015. Retrieved April 30, 2015. ^ a b c "LATEST ON POLICE-CUSTODY DEATH: COURT WAITS COULD INCREASE". Associated Press. April 29, 2015. Archived from the original on April 29, 2015. Retrieved April 29, 2015. ^ a b "Second Night of Baltimore Curfew Arrives Quietly". Al Jazeera America. April 29, 2015. Retrieved May 4, 2015. ^ Joseph Weber. "Riots rattle Baltimore homeowners, merchants key to urban revitalization". Fox News. ^ ABC News. "Baltimore Riot Damage Adds Burden to Small Businesses". ABC News. ^ "Cleaning up after Baltimore riots". CNN. April 29, 2015. Retrieved May 7, 2015. ^ Keady, Cameron (April 28, 2015). "Baltimore Residents Come Together To Clean Up City After Riots". The Huffington Post. Retrieved May 11, 2015. ^ "Protests Resume in Baltimore With Hundreds Marching on City Hall - WSJ". wsj.com. Retrieved May 4, 2015. ^ "FBI Dumps 18 Hours of Spy Plane Footage From Black Lives Matter Protests". ^ "Protests in Baltimore, Maryland 2015, Aerial Surveillance Footage". ^ "Count of damaged Korean-owned Baltimore businesses rises to 40". Korean Times. April 30, 2015. Retrieved June 16, 2015. Duggan, Paul; Jenkins, Jennifer (May 24, 2015). "After the Baltimore riots, a Korean storeowner picks up the pieces". Columbia Daily Tribune. Columbia, Missouri. Washington Post. Retrieved June 16, 2015. Halpin, Dennis P. (May 25, 2015). "The Other Racial Divide". The Weekly Standard. 20 (35). Archived from the original on June 17, 2015. Retrieved June 16, 2015. Collins, David (April 30, 2015). "Korean businesses especially hard hit by looters". WBAL. Baltimore, Maryland. Retrieved June 16, 2015. ^ Nixon, Ron (April 27, 2015). "Amid Violence, Factions and Messages Converge in a Weary and Unsettled Baltimore". New York Times. Retrieved June 16, 2015. ^ Aizenmen, Nurith (April 30, 2015). "Baltimore Unrest Reveals Tensions Between African-Americans And Asians". NPR. Retrieved June 16, 2015. ^ "After 'Victory Rally,' Arrests Made of Violators of Baltimore Curfew - ABC News". abcnews.go.com. Retrieved May 4, 2015. ^ W.J. Hennigan (May 3, 2015). "As Baltimore curfew ends, celebratory crowds peacefully gather". Los Angeles Times. Retrieved May 7, 2015. ^ "VIDEO: Reporter Handcuffed, Slammed On Pavement & Detained For Filming Baltimore Police Chase". ^ "Journalist Arrested Trying to Record Baltimore Police Making Arrest". ^ Nuckols, Ben; Dishneau, David (May 3, 2015). "Baltimore mayor lifts curfew 6 days after riots". Associated Press. ^ a b Justin Fenton (May 11, 2015). "Mayor's authority to impose curfew questioned". The Baltimore Sun. Retrieved July 12, 2015. ^ a b "Mayor Defends Baltimore Curfew, Says It Was Necessary To Keep Peace". cbslocal.com. ^ Scott Dance; Chris Kaltenbach (May 3, 2015). "Baltimore moves on as curfew is lifted, National Guard leaves". Baltimore Sun. ^ Miller, Jayne. 6 officers suspended in Freddie Gray case, WBAL, April 20, 2015. Retrieved April 30, 2015. ^ Payne, Ed; Almasy, Steve; Pearson, Michael (April 24, 2015). "Police: Freddie Gray didn't get timely medical care after arrest". CNN. Retrieved April 24, 2015. ^ Boswell, Craig (April 21, 2015). "Feds investigating Baltimore man's death in police custody". CBS News. Retrieved April 22, 2015. ^ Swaine, Jon; Laughland, Oliver; Jalabi, Raya (May 1, 2015). "Freddie Gray death: cries of 'justice' in Baltimore after six officers charged". The Guardian. Retrieved May 1, 2015. ^ "6 Baltimore Police Officers Charged in Freddie Gray Death". Retrieved May 1, 2015. ^ "Six Baltimore police officers face murder, other charges in death of black man". Reuters. Retrieved May 1, 2015. ^ Blinder, Alan; Perez-Pena, Richard (May 1, 2015). "6 Baltimore Police Officers Charged in Freddie Gray Death". New York Times. Retrieved May 1, 2015. ^ "Freddie Gray: Baltimore police to face criminal charges". BBC News. May 1, 2015. Retrieved May 1, 2015. ^ "Six officers charged in death of Freddie Gray". The Baltimore Sun. Retrieved May 1, 2015. ^ "Prosecutors to appeal judge's order blocking Porter testimony in trials of other officers". The Baltimore Sun. Retrieved February 6, 2016. ^ Fenton, Justin; Rector, Kevin (May 23, 2016). "Freddie Gray case: Baltimore Police Officer Edward Nero found not guilty of all charges". baltimoresun.com. The Baltimore Sun. Retrieved May 31, 2016. ^ "Protesters clash with NYPD, disrupt Holland Tunnel and West Side Highway in bid to support Baltimore activists". Daily News. New York. April 29, 2015. Retrieved April 30, 2015. ^ Mueller, Benjamin; Surico, John (April 30, 2015). "Over 100 Arrested as New Yorkers Protest the Death of Freddie Gray". The New York Times. Retrieved April 30, 2015. ^ "More Than 100 Arrested in Freddie Gray Protests in NYC: Sources". NBC New York. ^ "NYPD Cracks Down Hard On Baltimore Solidarity "Shut It Down" Protest". Gothamist. April 30, 2015. Archived from the original on April 30, 2015. Retrieved April 30, 2015. ^ Joe Rubino; John Frank (April 29, 2015). "Police User Pepper Spray on Downtown Protesters, 11 Arrested". The Denver Post. Retrieved April 30, 2015. ^ "Ann Arbor community members protest police brutality". Michigan Daily. May 4, 2015. Retrieved May 14, 2015. ^ Goldsmith, Alex (April 29, 2015). "Albuquerque's 'Baltimore' protests stay peaceful". KRQE. Retrieved May 4, 2015. ^ "Boston demonstrators marching in support of Baltimore's Freddie Gray protesters – Metro – The Boston Globe". BostonGlobe.com. ^ "#BlackLivesMatter Protesters March Through Minneapolis". WCCO-TV. ^ "Oakland: Protesters marching in solidarity with Baltimore told to disperse late Monday". Mercury News. ^ "Rally, March Held In Philadelphia In Solidarity With Baltimore Protests". KYW-TV. ^ "Seattle demonstrators support protests in Baltimore". The Seattle Times. ^ "Demonstrators Take to DC Streets, Support Baltimore Protest". NBC4 Washington. ^ "Violent clashes flare in Baltimore after Freddie Gray funeral". Al Jazeera. Associated Press. April 27, 2015. Retrieved April 27, 2015. ^ "Baltimore Mayor Imposes Curfew, Says 'Thugs' Trying To Tear Down City". CBS Baltimore. Associated Press. April 27, 2015. Retrieved April 27, 2015. ^ "Gov. declares state of emergency; activates National Guard". WBAL-TV. April 27, 2015. Retrieved April 27, 2015. ^ Bacon, John; Welch, William M. (April 27, 2015). "Baltimore police, protesters clash; 15 officers hurt". USA TODAY. Retrieved April 27, 2015. Police said more than two dozen people were arrested. The city's schools were canceled for Tuesday. ^ "Governor Larry Hogan Signs Executive Order Declaring State Of Emergency, Activating National Guard" (PDF). Government of Maryland. Retrieved April 27, 2015. ^ Laughland, Oliver; Lewis, Paul; Jacobs, Ben; Swaine, Jon (April 27, 2015). "Baltimore state of emergency declared as Freddie Gray protesters clash with police – live". The Guardian. ^ @matthewhaybrown (April 27, 2015). "Maryland State Police activating 500 officers for Baltimore; requesting up to 5,000 from neighboring states" (Tweet) – via Twitter. ^ "How Baltimore's Mandatory Curfew Is Affecting Area Restaurants and Bars - Eater". eater.com. Retrieved May 4, 2015. ^ "Baltimore’s curfew takes a toll on city businesses". rawstory.com. Retrieved May 4, 2015. ^ "The Baltimore Sun". baltimoresun.com. ^ Rector, Kevin (January 22, 2017). "Civil rights investigation into Freddie Gray's death unresolved as Trump takes office". The Baltimore Sun. Retrieved February 7, 2017. ^ "Ravens Cancel Draft Party Event". Baltimore Ravens. April 28, 2015. Archived from the original on April 30, 2015. Retrieved April 29, 2015. ^ Smith, Michael David (April 28, 2015). "Ravens cancel draft party amid riots in Baltimore". NBC Sports. Retrieved April 29, 2015. ^ Ghiroli, Brittany (April 28, 2015). "Today's White Sox-Orioles game closed to fans". Major League Baseball. Retrieved April 29, 2015. ^ Almasy, Steve (April 28, 2015). "Orioles game on Wednesday will have no fans". CNN. Retrieved April 28, 2015. ^ Dan Connolly, Orioles start fast in empty park, emerge from surreal day with 8–2 win over White Sox, Baltimore Sun (April 29, 2015). Retrieved May 1, 2015. ^ Winton, Richard (April 27, 2015). "LAPD officers to ride in pairs after Baltimore police warn of gang threat". Los Angeles Times. Retrieved April 27, 2015. ^ "Baltimore police say gangs 'teaming up' to take out officers". The Baltimore Sun. April 27, 2015. Retrieved April 28, 2015. ^ Porter, Tom (April 28, 2015). "Bloods and Crips gangs reject claims of kill-a-cop pact". International Business Times. Retrieved April 29, 2015. ^ "Gangs call for calm in Baltimore". The Baltimore Sun. April 27, 2015. Retrieved April 29, 2015. ^ Berman, John; Castillo, Mariano (April 28, 2015). "Baltimore gangs will help enforce curfew". CNN. Retrieved April 29, 2015. ^ Haake, Garrett W (April 28, 2015). "Gang members help prevent riot at Baltimore mall". WUSA. Archived from the original on April 29, 2015. Retrieved April 29, 2015. ^ Nixon, Ron (April 27, 2015). "Amid Violence, Factions and Messages Converge in a Weary and Unsettled Baltimore". The New York Times. Retrieved April 30, 2015. ^ Ryan Gorman (April 28, 2015). "Baltimore gangs call for peace after riots". Business Insider. Retrieved April 30, 2015. ^ "President Obama Condemns Violence After More Than 200 People Are Arrested in Baltimore". KTLA. April 28, 2015. Retrieved April 28, 2015. ^ Josh Levs (April 29, 2015). "After Baltimore riots, some leaders slam 'thug' as the new n-word". CNN. Retrieved April 30, 2015. ^ Mosendz, Polly (April 27, 2015). "As Riots Consume Baltimore, Orioles Postpone Baseball Game". Newsweek. Retrieved April 29, 2015. ^ Justin Wm. Moyer (April 29, 2015). "'Baltimore riots' transform into 'Baltimore uprising'". The Washington Post. Retrieved May 21, 2015. ^ Damien Cave (April 28, 2015). "Defining Baltimore: #Riot, #Uprising or #Disturbance?". The New York Times. Retrieved May 21, 2015. ^ Robert Lang (May 31, 2015). "Baltimore's Murder Total For May Climbs To 43". WBAL. ^ Amara, Kate (June 4, 2015). "Police Commissioner Anthony Batts blames stolen opiates for recent violence". The Baltimore Sun. Retrieved June 5, 2015. ^ Fantz, Ashley (June 5, 2015). "In Baltimore, allegations of police doing less as drugs are rampant". CNN. Retrieved June 5, 2015. ^ a b c "Baltimore Gets Bloodier As Arrests Drop Post-Freddie Gray". CBS News. May 28, 2015. What is happening, there is a lot of levels of confusion in the police organization. There are people who have pain, there are people who are hurt, there are people who are frustrated, there are people who are angry," Batts said. "There are people, and they've said this to me, 'If I get out of my car and make a stop for a reasonable suspicion that leads to probable cause but I make a mistake on it, will I be arrested?' They pull up to a scene and another officer has done something that they don't know, it may be illegal, will they be arrested for it? Those are things they are asking. ^ a b Daniel Dale (May 30, 2015). "After the riots, Baltimore has worst murder month since 1996". Toronto Star. ^ "West Baltimore's Police Presence Drops, and Murders Soar". The New York Times. Retrieved June 21, 2015. [A] flood of black-market opiates stolen from 27 pharmacies during looting in April, enough for 175,000 doses now illegally available for sale. Why Baltimore Rebelled. Jacobin. April 28, 2015. The rebellion in Baltimore is an uprising against austerity, claims top US academic. The Guardian. May 2, 2015. Wikimedia Commons has media related to 2015 Baltimore riots. This page was last edited on 21 April 2019, at 04:24 (UTC).